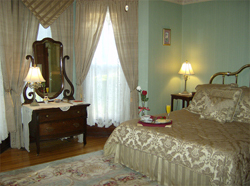 The Lincoln Room, which is our most popular room, features a queen Old World design four-poster bed, Victorian fainting couch, cushioned armchair, antique oak dresser, hair dryer, ceiling fan, a/c, WI-FI, flat-screen television with Dish Network access, DVD player with private bath in room. Room rate is $129 per night. Cash or check rate is $125. 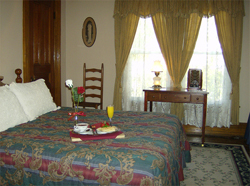 The Pennsylvania Room features a queen brass bed with luxurious linens, antique oak dresser with mirror, period sitting chair, hair dryer, ceiling fan, a/c, WI-FI, flat-screen television with Dish Network access, and private bath in room. This spacious room catches the mid-afternoon sun and is located on the first floor. 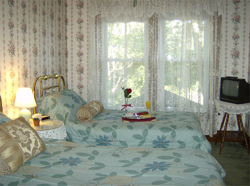 The South Room features a queen size brass bed with luxurious linens, antique dresser with mirror, red velvet sitting chair, hair dryer, ceiling fan, a/c, WI-FI, flat-screen television with Dish Network access. This spacious room offers leafy vistas from its large southern facing windows. South Room with private bath in hall. Room rate is $119 per night. Cash or check rate is $115. The North Room features a queen size cannonball pine bed, antique writing desk with chair, oak period antique dresser with mirror, ceiling fan, a/c, WI-FI, flat-screen television with Dish Network access. North Room shares a large bathroom in the hall. Bathroom boasts an antique claw foot bathtub with shower accessibility along with an antique pedestal sink and hair dryer. Room rate is $104 per night. Cash or check rate is $100. 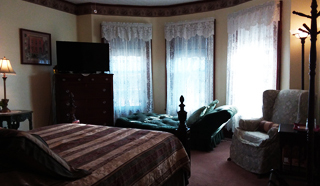 The Clara Barton Room is the coziest of the rooms which has two twin brass beds with porcelain motifs, wicker dresser and mirror, ceiling fan, a/c, WI-FI, television with Dish Network access. The Clara Barton Room shares a large bathroom in the hall. Bathroom boasts an antique claw foot bathtub with shower accessibility along with an antique pedestal sink and hair dryer. Maximum occupancy in this room is two guests. 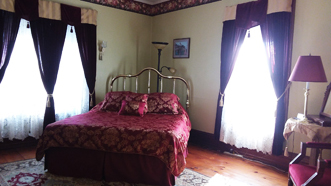 Another option available is to book either the North Room or the Clara Barton Room with a private bathroom for $150. Guests should call ahead first to verify the availability of either of the rooms with a private bathroom and mention wanting the private bathroom at the time of booking. They will then reserve their room and the other room not reserved will be blocked and unavailable for any guests to use. If both guest rooms are desired, with the shared bathroom, the price is the regular credit card rate at $104 per room for a total of $208. Cash or check rate is $100 per room for a total of $200. *All rates are subject to state and local occupancy tax.